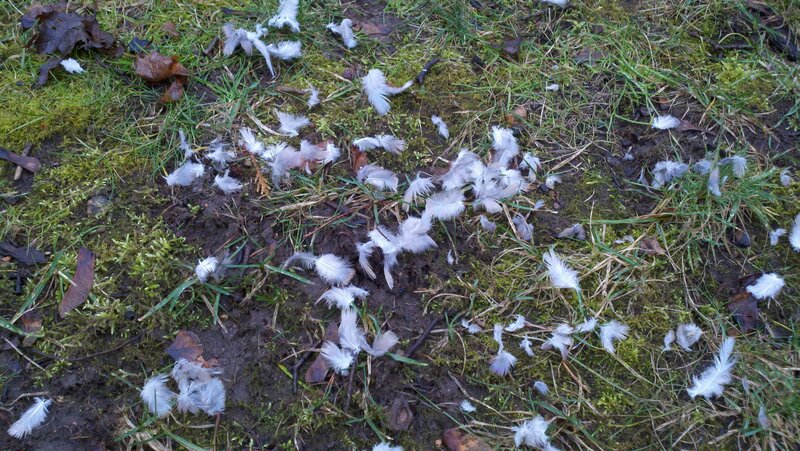 At approximately 9am on January 13, an avian act of violence occurred in a suburban backyard in eastern North America. Who was the predator and who was the prey? The following photo is your only piece of evidence beyond date, time, and location. But why did you eat your pet duck? Judging from what happens at my brother’s feeders in upstate New York, I’ll guess the predator is a cooper’s hawk and the prey is a mourning dove. I’m guessing the predator is something more nefarious than a raptor like a cat. The prey might have been a pigeon?! Sharp-shinned Hawk takes a Tufted Titmouse. Domestic cat tried to catch pigeon. Pigeon got away, shedding feathers. I also think it looks like Cooper’s Hawk & Mourning Dove. More likely… a Sharp-shinned Hawk and a Blue Jay. A mourning dove attacked by a were-squirrel. Great horned owl vs: a bird with lots of white feathers, or used to have lots of white feathers! A Cooper’s Hawk and a Collared Dove. Congrats to all of you who correctly guessed both predator and prey. Kudos to those of you who guessed one and were close on the other. As for anyone who mentioned lycanthropes, I have nothing to say to you.